Kuala Lumpur(VNA) – The first ever Vietnamese language class for Vietnamese descendants in Malaysia began on October 16. 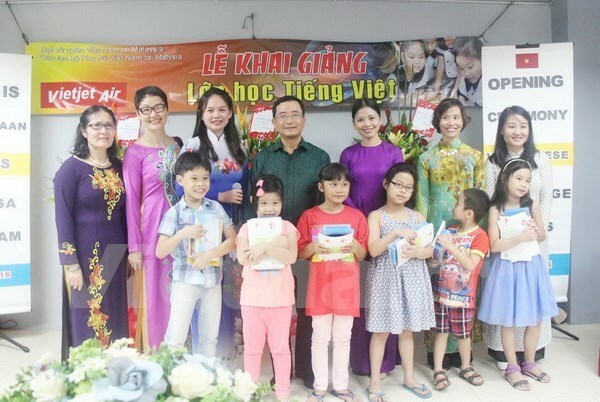 About 30 Vietnamese youngsters, with 80 percent of them being children of Vietnamese women marrying foreigners, attended the class, which is opened once a week on Saturday. They are divided in two classes based on ages and placement test results, and use textbooks brought from Vietnam, which were compiled under the program of Vietnam’s Ministry of Education and Training. The classes, which is co-organised by the Vietnamese Women Club and the Vietnamese Embassy in Malaysia, are run by two main teachers, who can get help from six other standbys from the club. Speaking at the opening ceremony, Pham Cao Phong, Vietnamese Ambassador to Malaysia, appreciated effort of the Vietnamese Women Club in preparing the class.